Hops and spent hops are poisonous to dogs. Last week I received another heartbreaking note from an owner who had lost their dog after it consumed some spent hops left in a compost pile. Over the years I’ve received several of these notes, so I thought I would put together a short article to raise awareness of this issue. 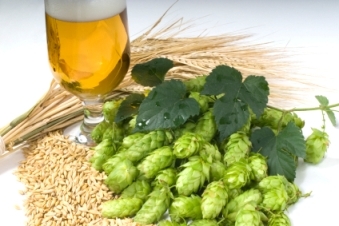 Hops is a member of the Cannabinaceae family, and the female plant produces cones which are dried and used by brewers as a bittering agent in beer worldwide. Hops are often used as a calming agent sold as teas, extracts and herbal supplements. Some dog treats even contain very small quantities of hops to calm the dog and relive anxiety. Unfortunately in larger quantities hops are toxic and potentially deadly to most dogs. There has not been a lot of detailed research in this area, so the exact quantity of hops that is lethal to a dog is unknown. Also some breeds (Greyhounds, Retrievers, Saint Bernards, Pointers, Dobermans, Border Collies, English Springer Spaniels) do seem to be more susceptible to hop poisoning than others. Suffice it to say many dogs have died after ingesting spent hops/grains left outside by a homebrewer. Since the precise toxic effect on any particular dog are unknown it is probably best to consider all hops as toxic and potentially lethal to your dog. The primary symptom of canine hop poisoning is a malignant hyperthermia reaction which manifests itself with a rapid rise in body temperature. The dog’s temperature, normally below 102 F can rapidly rise to 108 F or higher, resulting in an unwinding of the body’s proteins, permanent brain damage and death. In addition the dog may suffer from redness around the mouth, excessive panting, excitement, flatulence, abdominal pain, seizures, and rapid heart rate. The onset of symptoms can occur anywhere from 30 minutes to 12 hours after ingestion. If not treated immediately, death can occur in as little as 6 hours. Treatment includes induced vomiting, gastric lavage (washing out the stomach under anesthesia), enemas, charcoal and actively cooling the dog. Cooling the dog is very important as their body temperature will rise rapidly. A trained vet is the only person that can effectively treat and save your dog from hop poisoning. If your dog does ingest hops, take them immediately to a vet or animal emergency room, and try to keep them cool. Even with rapid treatment, the prognosis is guarded to poor. The best way to protect your pet is to prevent them from ingesting hops in the first place. While dogs are not likely to ingest raw hops (it is quite bitter), you should not leave your hops in an area accessible by the dog. Most hop poisoning is a result of leaving spent grain/hop mixture from brewing out. Usually this is the trub remaining after the boil, and it should not be left unattended after chilling the wort, or dumped into a compost pile or trash bin that the dog has access to. Unfortunately the sweet mixture of spent grains/hops are quite tasty to a dog, so never leave your spent grains/hops unattended or in an area the dog has access to. Double bag them and then put them in a secure trash container that the dog can’t get into. So now you know why hops and dogs don’t mix! Thanks for joining me on the BeerSmith Home Brewing Blog. Be sure to sign up for my newsletter or my podcast (also on itunes…and youtube…and streaming radio station) for more great tips on homebrewing. You state that hop consumption can cause the ingest-or to “suffer from redness around the mouth, excessive panting, excitement, flatulence, abdominal pain, seizures, and rapid heart rate”. I’ve seen a lot of that in bars around town. But seriously, why don’t these same symptoms appear in people? Personally, I know that slight abdominal pain and gas always accompany too many IPAs. Have any studies been done on the effects on people? Thanks. I enjoy the articles and I am a big fan of the software. Heartbreaking stuff. An important FYI for any brewer. I reckon I just watched muh german short haired pointer munch on some cascade pellets that hit the flur. He seems to be alright I guess your dogs are just pussies. Thanks for this article. I don’t own a dog, but dump my trub on the side of my house. Lots of people walk there dogs by our house and I’ve watched many inconsiderate owners let there dog walk up by the side of our house. One time a dog was eating the trub, but I had no idea the stuff could be poisonous. Luckily I think the dog was ok, but from now on I’ll make sure to just dump the trub down the toilet.